NASA scientists have found a new world orbiting the solar system – more than 3 billion kilometers further away from the Sun than Pluto and 40 years away from Earth in a space shuttle. Measurements suggest Sedna's diameter is almost 2000km – the biggest find in the solar system since Pluto was discovered 74 years ago. It is believed to be made of ice and rock, and is slightly smaller than Pluto. This reported size in much to small to be a candidate for the "Planet X" or "Nibiru" as described by the Sumerian Culture. 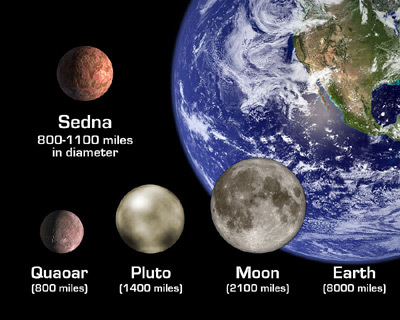 "Sedna is very big, and much further out than previous discoveries," he said. "I'm pretty sure there are other large bodies up there too." Too learn more about these topics, watch the 90min lecture I gave recently The Seatch for Planet X. It's another world...but is it our 10th planet?